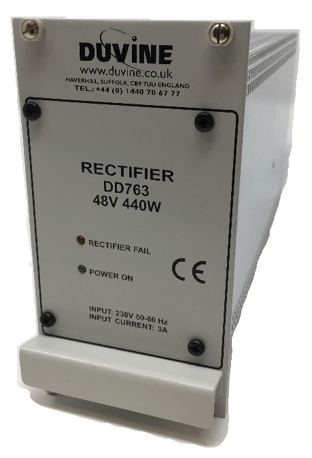 A Rectifier is an electronic device that converts alternating current (AC), which periodically reverses direction, to direct current (DC), which flows in only one direction. Many applications of rectifiers, such as power supplies for radio, television and computer equipment, require a steady constant DC current. In these applications the output of the rectifier is smoothed by a voltage regulator to produce a steady current. Duvine’s 30 years experience with switch-mode power supplies (SMPS) means that our rectifiers have higher power conversion efficiencies (these are typically > +90%) than linear power supplies. SMPS is an electronic circuit that converts power using switching devices that are turned on and off at high frequencies. They are smaller and lighter in weight than Linear power supplies, so they offer a much higher power density and are very cost effective.